Snowboxx once again returns to Avoriaz this March, bringing with it a week of live music acts, fun mountain events, ‘bottomless brunches’ and legendary apres parties. 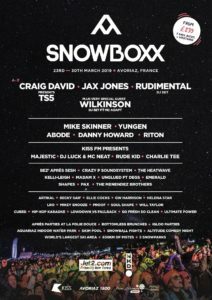 With acts such as Craig David, Rudimental, Danny Howard and Jax Jones, it’s an epic week of music and snow! Snowboxx returns to Avoriaz from 23rd – 30th March and for the same week, we are offering discounted last minute prices in our luxury catered Chalet Doyen in Morzine. So if you fancy enjoying some live music on the slopes of Avoriaz, in the comfort of complete luxury & tranquility in Morzine – Chalet Doyen is now reduced to only £899 per person from 23 – 30 March 2019 (reduced from £1050pp!). Chalet Doyen brings exclusive luxury in our purpose built 6 bedroom ensuite chalet, featuring sauna, hot tub, snug tv room and boutique contemporary style in the heart of Morzine. So why not plan your holiday this March to enjoy some live music on the higher slopes of Avoriaz and yet able to retreat back to luxurious comfort in Morzine. Prices based on 2 per room. Subject to availability (first come, first serve).